I noticed two bits of news while catching up on my blog subscriptions. UCaaS is a cloud-based delivery of integrated UC capabilities spanning voice, messaging, conferencing and presence. Businesses of up to 3,000 employees are now deploying UCaaS, with expansion to larger accounts expected in 2012 as offerings from larger UCaaS suppliers mature. In this report they put Microsoft's offering, Office 365, in the Challengers quadrant. It's interesting to note that no one is in the Leaders quadrant. The report explains how services were evaluated as well as the strengths & weaknesses of each offering. Microsoft is a strong brand and is marshalling significant corporate marketing, technical, support and channel resources toward UCaaS. The company has largely met its product release commitments and has a solid future product road map. Business users are attracted to the Office 365 pricing model (see "Vendor Focus for Microsoft: Office 365 for Cloud Unified Communications"). Other strengths are the role-based portal, ease of administration and employee familiarity with Microsoft applications. User adoption has been significant, led by messaging, collaboration, presence and Web conferencing. Microsoft has been reasonably successful in scaling support services to match early demand. 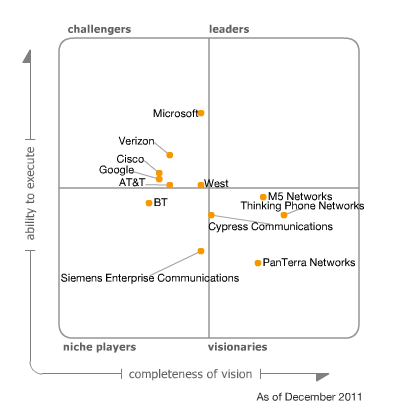 Telephony is the weak link in the Microsoft UCaaS portfolio. The current pure cloud VoIP solution is more of a parallel VoIP service (for low-cost intercompany communications) rather than a PBX replacement. Enterprise-grade VoIP can only be secured in a hybrid environment, where Exchange and SharePoint servers are located in the cloud, synched with Lync servers on-premises. Microsoft continues to experience intermittent service outages. Some users indicate that despite these visible outages, Microsoft offers an availability (Microsoft offered a SLA equal to 99.9%) equal to what the company could provide internally.